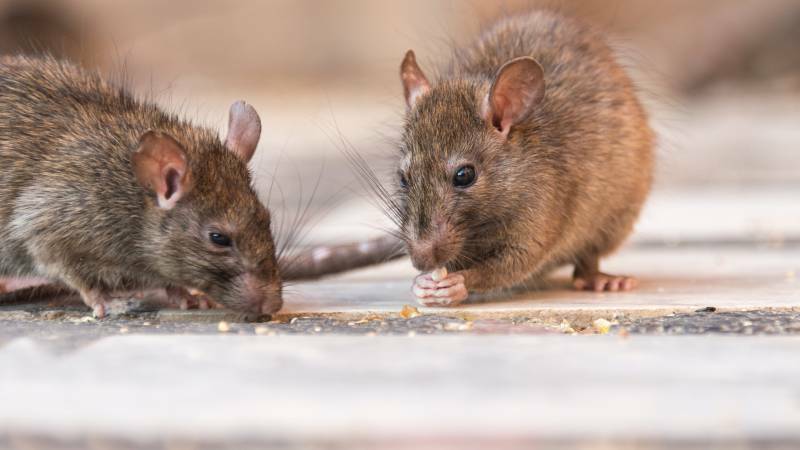 Nobody wants to discover they have a rodent problem, but homeowners across the U.S. are dealing with rat infestations increasingly often. And you don’t have to live in a dirty or crowded area to wind up with rats. Discovering rats in your house could mean other problems are on the horizon, from diseases to structural damage. Droppings: Rat droppings are dark, oblong, and tapered at either end. The size varies depending on the size of the rat, and you’ll usually find them clustered together rather than spread throughout the house. Rub marks: Greasy markings from rats’ fur indicate they’ve been making paths through the house. Chewing: Chew marks are evidence of rats gnawing their way through wood and other materials to make tunnels for easy travel. Nests: Collections of shredded insulation, cardboard, paper, and other soft materials are common, especially when rats are getting ready to reproduce. You may also be able to hear rats squeaking, hissing, chattering, or scratching inside the walls or ceiling. Even if you can’t hear them, pets sometimes react to the smell and will paw at or become very interested in areas where rats are present. Hantavirus Pulmonary Syndrome (HPS): Transmitted through urine, droppings, and saliva, the pathogens responsible for HPS can be inhaled in homes where rats are present. This disease can be deadly if contracted. Murine Typhus: This form of typhus presents with flu-like symptoms, including chills, headache and fever. It’s more common if you’re bitten by fleas from infected rats. Rotavirus: A digestive virus common in children, rotavirus may be spread from rats to people via rat droppings. Leptospirosis: In this bacterial infection, symptoms may be similar to those of a nasty bout of the flu. Leptospirosis is one of the most common diseases transmitted from animals to humans and can result in meningitis, kidney damage, liver failure, or even death. Because a rat infestation is such an urgent issue, you want to deal with an exterminator you know is equipped to get the job done right the first time. Look online to find a list of pest control companies specializing in rodent control in your city and read reviews from other customers to rule out any with questionable practices or poor track records. Rats can get into your house just about anywhere and hide out in places you wouldn’t think to look. If you try to close off all potential points of entry yourself, it’s likely you’ll overlook or miss several spots. Professional exterminators can conduct much more thorough assessments and searches, and they know the best methods for keeping rats out. Professionals are also trained in various methods of pest control and can suggest the best solution to deal with an infestation. Allowing them to handle the problem may seem like a significant investment, but you could wind up spending more trying multiple DIY methods in an attempt to find the right one. A good exterminator should be able to get rid of any rats or rat infestation the first time they do their job. When you find an exterminator you trust, you can rest assured your home will be rat-free in no time. If you’re interested in finding pest control for rats, start a search today.